Mondays were always difficult for me to get going, back when I was working. (I am currently a stay at home mom, and yes, that requires effort, but I can do it in my pajamas.) Getting up after a nice weekend, getting ready to be presentable at work, AND having breakfast didn’t always happen smoothly. Put oil, onion and potato in skillet on medium heat, cook until almost transluscent, about 8-12 minutes. Add crumbled bacon and cook about 2 minutes longer. Add eggs and continue cooking until eggs are set. Turn off skillet. 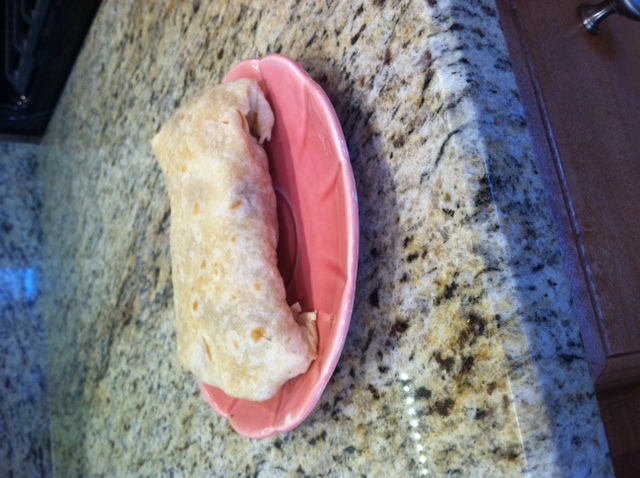 Warm tortillas in the microwave for about 20-30 seconds. Spoon avocado, sour cream, and cheese into tortilla, then add egg mixture. 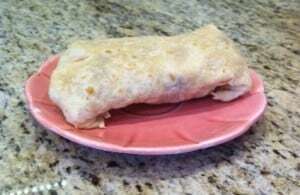 Wrap in tin foil and put into refrigerator or freezer. Voila, breakfast for a week! Ah, this is just what I needed! I’ve been trying to get us off of cereal every morning, and looking for ways to cut sugar at breakfast. These sound great! These are really easy to make, and absolutely no sugar added! Doctor them up with whatever veggies you have lying around. What?! Breakfast Burritos without beans?!? I didn’t think of beans. Good addition. I will try them next week! I could eat Mexican food every single day. You just made me really hungry. Thanks for sharing this recipe. You are welcome. Let me know how you like it! So easy to make and very yummy. Had some yesterday for breakfast. Added extra heat to mine with Tabasco. Just wanted to let you know. I usually will just make these made to order, but the make-ahead approach is awesome since they’re kind of labor intensive to make. Good idea! I considered making them to order, but in this case, everyone likes the same things. Making a couple of different batches, like substituting the bacon for sausage, or adding green peppers, would be a great way to mix things up so you aren’t eating the exact same thing every day. I wrap mine in parchment or waxed paper so they are microwaveable. But I guess you could just remove the foil before microwaving. I like this suggestion. I put it in foil, because we were taking them camping. But parchment (the gift to bakers and cooks) is a great idea! Thanks! Yum! I’m going to be trying these real soon! Thanks, Lisa. I hope you like them!